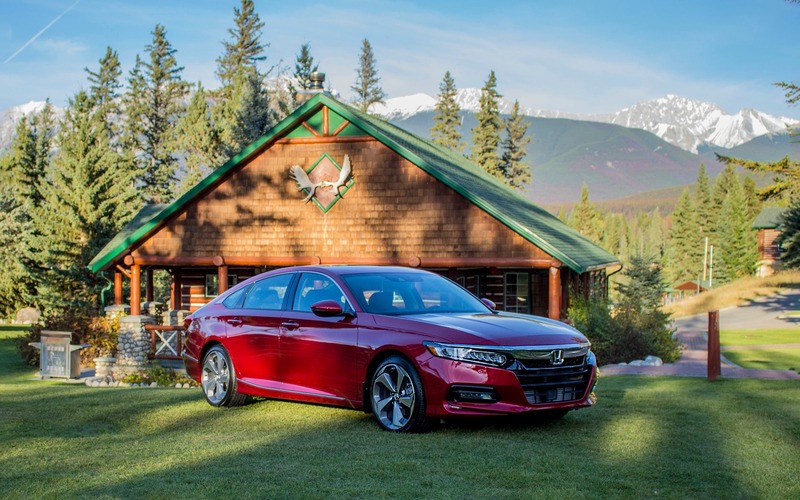 JASPER, Alberta – I could resume my first drive report of the 2018 Honda Accord in one quick paragraph: it’s a well-put-together and enjoyable-to-drive midsize sedan that should retain its market value for a long time without being plagued with too many mechanical problems. The end. That’s because it’s hard to criticize the Honda Accord. For over 40 years, it has ranked among the best buys in its segment. It’s also one of the best-selling cars in Canada. This is why each time Honda presents us to a new generation of the car, we’re worried it won’t be as good as the last, even though we know it will. Also: 2018 Honda Accord revealed! Also: We’re Heading to the Rockies for the 2018 Honda Accord! So, what must the Accord do to remain the queen of the midsize sedans? Remain true to what it has always been: an excellent automobile. The first thing you notice when laying eyes on the 2018 Accord, is its completely redesigned silhouette. With the coupe now gone, Honda aimed at combining two cars in one by integrating the swooping lines of the coupe to the practicality of the sedan. Personally, I quite like it! But this new fastback design also has another purpose: to inject a bit of life into a slowly dying segment. In recent years, midsize sedans, which have long had the mandate to carry families from point A to B in total discretion, have been bolder and more attractive than ever; the Mazda6 and the all-new Toyota Camry are perfect examples. The goal, of course, is to slow down the hemorrhage currently observed in sedan sales, a segment that is losing more and more popularity in North America. Honda does however remain confident that the Accord’s popularity will help it survive the SUV craze. 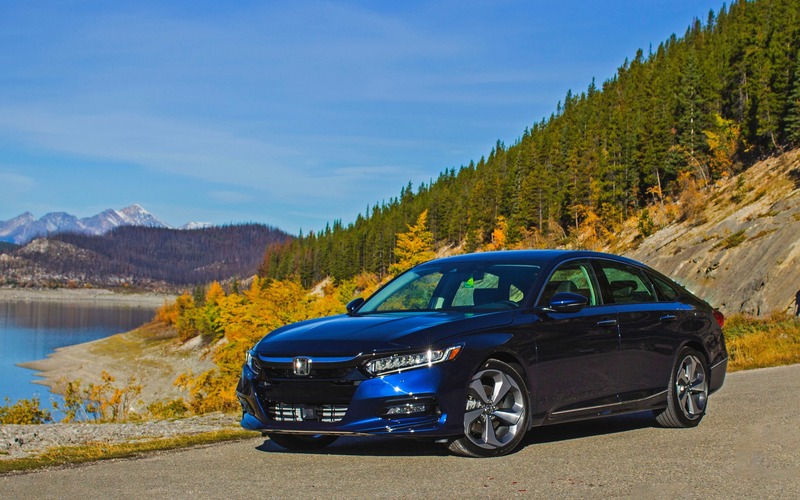 According to its own research, Honda claims there are more than 120,000 Canadian consumers that still desire a midsize sedan. Honda therefore expects to sell 15,000 Accords per year. Under the sporty silhouette sits an all-new platform. Although the car may appear longer than the model it replaces, the 2018 Accord is actually 8 mm shorter. Actually, it’s the wheelbase that was stretched by 53 mm. The car was also widened by 10 mm and lowered by 15 mm. The same applies for the car’s seating position, which was lowered by 22 mm. The new platform also improves rear leg clearance by 42 mm, all while reducing the car’s overall curb weight by 6%. But it’s under the hood that things become interesting. 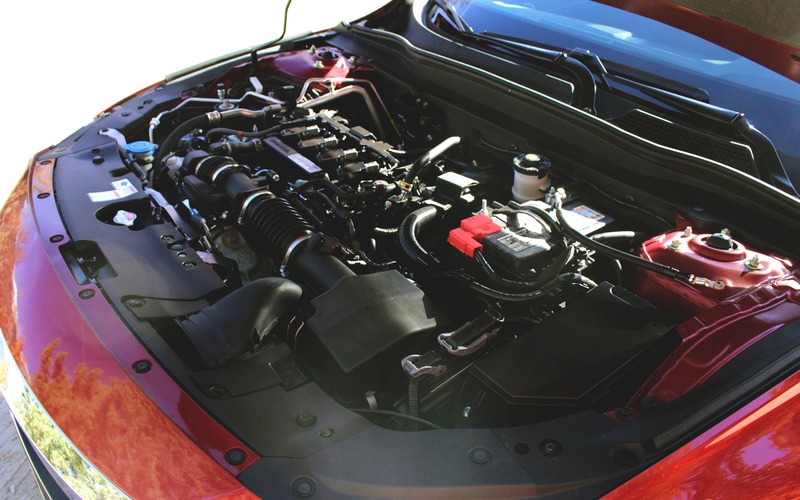 The naturally aspirated VTEC engines are now discontinued and replaced by all new turbo units (a hybrid variant is scheduled to arrive next year). Entry-level cars come with the same 1.5-litre unit as in the Civic and CR-V. It’s good for a claimed 192 horsepower and 192 lb.-ft. of torque. Two transmissions are offered, either a six-speed manual or a continuously variable automatic. Replacing the V6 is an all-new 2.0-litre turbo four, which shares several mechanical components with the Civic Type R’s engine. For the Accord, Honda says it’s good for 252 horsepower and 273 lb.-ft. of torque. That’s almost 20 lb.-ft. more than the V6. The new engine can either be bolted onto a brand new ten-speed automatic or a six-speed manual. Although not many consumers will opt for the manual gearbox, kudos to Honda for remaining faithful to its driver-focused heritage! The word to remember for the 2018 Honda Accord is “balance.” There aren’t many cars out there that combine comfort, sophistication, driver engagement and value better than the Accord. On the road, the stretched wheelbase gives the car more poise, making it feel more planted to the ground, especially in the bends. Although this new Accord is lighter than the last model, it strangely feels heavier behind the wheel. But it doesn’t prevent the Accord from carrying speed effortlessly in the twisties. I was however very impressed by the 1.5-litre engine. It develops good power, given the weight it needs to carry around. It responds with eagerness and offers decent low-end torque, more so than what most buyers will need. It is a loud unit though, especially during hill climbs. The CVT, in typical Honda fashion, operates smoothly and optimizes the engine’s torque curve rather well. But if you want my honest opinion, get the manual. It does a much better job at getting the most out of the tiny engine’s power band. As for the 2.0-litre, it’s powerful, but that’s about it. I was expecting a bit more oomph when the turbo kicks in. Instead, it’s all too sober and doesn’t make enough of a case to consider it over the 1.5. It essentially lacks character, unlike the V6, which yelped and barked. But what this engine lacks in eagerness, it makes up for in refinement. It’s smooth and loves to rev, all while sounding truly mechanical; rare qualities for a turbo engine. The new automatic gearbox is a solid improvement over the last one. It downshifts quickly and picks up the next gear in utter smoothness. And the paddle shifters are enjoyable to use, quick to react and demonstrate the type of precision you typically don’t find in this segment. And the manual? It’s a Honda shifter, meaning it’s excellent. Period. I was however disappointed by the clutch pedal’s friction point. It’s essentially non-existent, and feels as if your foot is passing through a cloud! Inside the 2018 Honda Accord, occupants are greeted to a functional yet well-put-together cabin filled with upscale materials. It’s a comfortable place to be, but the front seats remain hard, especially in Sport trim. Despite this, the Accord’s cabin is a benchmark in ergonomics, controls are easy to locate and a breeze to operate. The new Display Audio infotainment system is a welcome upgrade and frankly excellent. Honda went from having one of the worst systems in the business, to one of the best. Android Auto and Apple CarPlay are standard, as well as Honda Sensing. That’s Honda’s term for semi-autonomous driving aids. Four USB ports are spread out across the cabin, and high-end trim levels come with NFC wireless smart phone pairing. What impressed me the most about Display Audio is that it’s easy to comprehend, quick to react and enjoyable to use. Oh and: there’s a volume knob now! So here’s how I’ll resume my first drive of the 2018 Honda Accord through the Canadian Rockies: the car is just as good as the ones that came before it. Actually, I’ll go as far as saying that this is the best Accord to date. The basic ingredients remain: the Accord stands out of the segment by being elegant, well equipped and intelligently put together; traits that should help it remain a segment best-seller for years to come. 8/10	Interestingly, we observed similar ratings between both engines: 7.0 L/100 km for the 1.5-litre and 7,5 L/100 km for the 2.0-litre, which is excellent. 7/10	It's a roomy cabin, but the front seats are hard, especially in Sport trim. 8/10	The 1.5-litre offers plenty of grunt. The 2.0-litre pulls strong, but lacks caracter versus the V6. 9/10	Intuitive, quick to react, easy to comprehend. Android Auto and Apple CarPlay are standard. Excellent system! 9/10	Solid chassis, compliant handling, refined composure and entertaining to drive. 8/10	Overall, an excellent midsize sedan that harmoniously blends sophistication, practicality and driving dynamics in an affordable package.